This is equivalent to adding a second fixed effect and a continuous covariate to your model. Since lactic acid buildup is more pronounced at higher altitudes, you will include altitude as a factor in the model along with fluid, extending the one-way ANOVA to a two-way ANOVA. In doing so, you expect to lower the residual standard deviation from about 3.75 to 3.5 (in addition to generalizing the study results). You assume there is negligible interaction between fluid and altitude and plan to use a main-effects-only model. You conjecture that the mean lactic acid buildup follows Table 48.11. By including a measurement of body mass index as a covariate in the study, you hope to further reduce the error variability. The extent of this reduction in variability is commonly expressed in two alternative ways: (1) the correlation between the covariates and the response or (2) the proportional reduction in total R square incurred by the covariates. You prefer the former and guess that the correlation between body mass index and lactic acid buildup is between 0.2 and 0.3. You specify these estimates with the NCOVARIATES= and CORRXY= options in the POWER statement. The covariate is not included in the MODEL statement. You are interested in the same four fluid comparisons as in Example 48.1, shown in Table 48.10, except this time you want to marginalize over the effect of altitude. For each of these contrasts, you want to determine the sample size required to achieve a power of 0.9 to detect an effect with magnitude according to Table 48.11. You are not yet attempting to choose a single sample size for the study, but rather checking the range of sample sizes needed by individual contrasts. You plan to test each contrast at = 0.025. You will provide twice as many runners with water as with any of the electrolytes, and you predict that you can study approximately two-thirds as many runners at high altitude than at low altitude. The resulting planned sample size weighting scheme is shown in Table 48.12. Since the scheme is only approximate, you use the NFRACTIONAL option in the POWER statement to disable the rounding of sample sizes up to integers satisfying the weights exactly. The variables Altitude, Fluid, and LacticAcid specify the factors and cell means in Table 48.11. The variable CellWgt contains the sample size allocation weights in Table 48.12. The CLASS statement identifies Altitude and Fluid as classification variables. The MODEL statement specifies the model, and the WEIGHT statement identifies CellWgt as the weight variable. The CONTRAST statement specifies the contrasts in Table 48.10. As in Example 48.1, the order of the contrast coefficients corresponds to the formatted class levels (EZD1, EZD2, LZ1, LZ2, Water). The POWER statement specifies total sample size as the result parameter and provides values for the other analysis parameters. The NCOVARIATES= option specifies the single covariate (body mass index), and the CORRXY= option specifies the two scenarios for its correlation with lactic acid buildup (0.2 and 0.3). Output 48.2.1 displays the results. 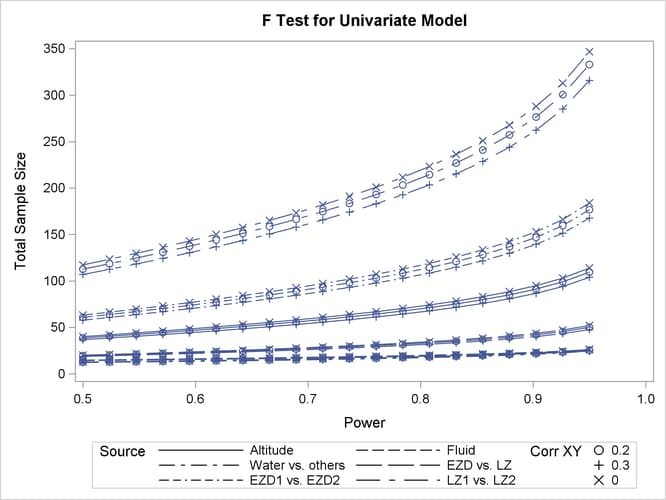 The sample sizes in Output 48.2.1 range from 21 for the comparison of water versus electrolytes (assuming a correlation of 0.3 between body mass and lactic acid buildup) to 275 for the comparison of LZ1 versus LZ2 (assuming a correlation of 0.2). PROC GLMPOWER also includes the effect tests for Altitude and Fluid. Note that the required sample sizes for this study are lower than those for the study in Example 48.1. Note that the error standard deviation has been reduced from 3.5 to 3.43 (when correlation is 0.2) or 3.34 (when correlation is 0.3) in the approximation of the effect of the body mass index covariate. The error degrees of freedom has also been automatically adjusted, lowered by 1 (the number of covariates). See Output 48.2.2 for the resulting plot. In Output 48.1.2, the line style identifies the test, and the plotting symbol identifies the scenario for the correlation between covariate and response. The plotting symbol locations identify actual computed powers; the curves are linear interpolations of these points. 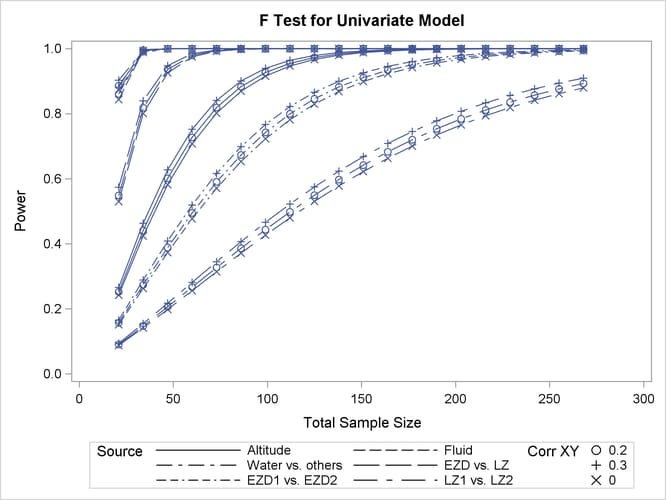 As in Example 48.1, the required sample size is highest for the test of LZ1 versus LZ2. Finally, suppose you want to plot the power for the range of sample sizes you will likely consider for the study (the range of 21 to 275 that achieves 0.9 power for different comparisons). In the POWER statement, identify power as the result (POWER= . ), and specify NTOTAL= 21. Specify the PLOT statement with X= N to request a plot with sample size on the X axis. The MAX= 275 option in the PLOT statement sets the maximum sample size value. The MIN= option automatically defaults to the value of 21 from the NTOTAL= option in the POWER statement. See Output 48.2.3 for the plot. Although Output 48.2.2 and Output 48.2.3 surface essentially the same computations for practical power ranges, they each provide a different quick visual assessment. Output 48.2.2 reveals the range of required sample sizes for powers of interest, and Output 48.2.3 reveals the range of powers achieved for sample sizes of interest.